Designed for off-road and motorsports applications that require high ground clearance, Crawl King portals offer an additional 4.9″ lift from the bottom of the diff. The 1.5:1 reduction in the gearboxes transfers torque while keeping stress on the axle relatively low while the extra mass close to the ground level acts as a countermeasure to the lift. Combining AxleTech US Gear portal boxes with genuine Dana Spicer housings and gearing, this set of axles will be custom built and shipped to each customer’s specifications. Price: $22750.00, includes front and rear. 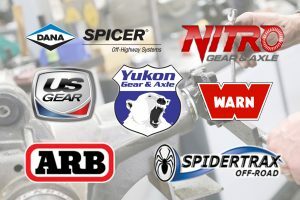 Please call or email us to discuss your customization specs: axle width, diff drop, offset, caster and pinion angles, and any changes to the above standard specifications you want to make. 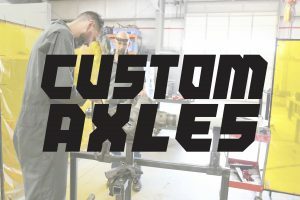 EmWest Motorsports is committed to building custom axles using not only the brands we believe in, but the brands you support too. For example, if you prefer to use Yukon Ring and Pinions, let us know! Portals: Do not include park brake provision. Suspension and steering design crucial to a build with portal axles.